Are Hearts & Arrows Super Ideal Cut Diamonds Worth the Extra Money? For the majority of our readers, following our basic cut guidelines will help you find a diamond that has fire and brilliance while maximizing size for ultimate value. There are some readers who really want to focus on the cut of the diamond to maximize brilliance (which come at a cost – usually it’s size). As always, feel free to contact us for personal help navigating the diamond buying minefield. For those readers looking to dig deeper, let’s explore the world of super-ideal diamonds. That starts with Hearts and Arrows. Reading about cut dimensions, proportions and grades is similar to reading the technical specs on a car. The bottom line is that most people don’t care about specific specs only focusing on the results. 99% of the people don’t care how much torque a car has. They just want to know that the car will accelerate to their satisfaction. The same is true of diamonds. People don’t care how a 34.5 degree crown angle pairs with a 56% table. They just want to know that the diamond has fire and brilliance (put even more simply, that is sparkles). Take this stunning 1 carat diamond from Blue Nile’s Astor Collection for example. I can wax poetically about how great the 33.5 crown angle is for this diamond. Bottom line is the diamond is gorgeous. You can easily look at a diamond and tell whether there is a noticeable yellow hue, or whether there is a garish inclusion. Brilliance though? That’s a tougher nut to crack. Sure you can notice if a diamond has spectacular brilliance or if its completely dead. But there is a wide range in between. What are Hearts & Arrows. If you look at enough diamonds, you’ll start to notice some interesting reflective patterns. Take a look at these three diamonds. In the first two, you can see a consistent starburst pattern of arrows. This is the hallmark of a well cut round diamond. What you are seeing is the reflection of the crown of the diamond through the table facet. In the third diamond, you can tell from the video that the depth and crown angle are off just by seeing the lack of an arrow pattern. 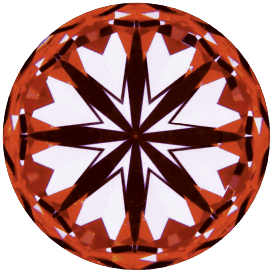 In the 80s someone in Japan developed a scope that, when looking at a diamond inverted, reveals hearts in between each of those arrows on the starburst. This is where the concept of Hearts & Arrows was born. Its pretty safe to say that there is a strong correlation between a diamond that exhibits hearts & arrows and a diamond that performs well in brilliance. This is not a bulletproof distinction that helps you determine if a diamond is brilliant. There are occasions where a diamond is superbly cut and is very brilliant, yet some of the hearts or arrows are subpar. 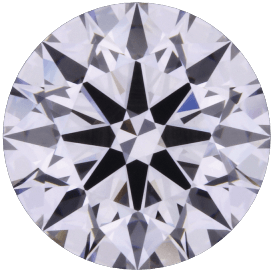 Ultimately the diamond specs are the best way to analyze a diamond to determine how consistently brilliant (in all lighting scenarios) a diamond will be. This fairly simple way to look at a diamond has attracted many companies to the idea of utilizing it for their brands. Unfortunately, those brands run the gamut from superbly cut to downright dubious. On the one hand you have the industry leaders when it comes to cut like Hearts on Fire and Brian Gavin. On the other hand, you can have some pretty poor claims of brilliance like the EGL Hearts and Arrows certificate. Almost every company out there has a distinctive selection of “perfectly cut” diamonds. In my opinion, the overwhelming majority of these brands don’t live up to their brilliance hype. With rare exceptions, I don’t find these brands to be consistently or noticeably more brilliant than a typical excellent cut we select using our cut standards. However, I do love Brian Gavin’s Signature and Black selections. In my years traveling the US selling diamonds, working on the wholesale side of the business and my years helping Diamond Pro readers, I have not found any company whose diamonds blew me away as much as Brian Gavin’s did. I’ve known Brian for years (after unsuccessfully trying to sell him diamonds from my company that weren’t up to his standards) and am impressed with the breadth and depth of his diamond expertise. We’re not saying this is for everyone. But if you want to focus on cut, this is where you get the best bang for your buck. This is something that we can’t stress enough. It’s imperative for people to understand that hearts & arrows do not cause a diamond to be brilliant. They are an effect of a perfectly proportioned round cut diamond. In some ways, it’s a side effect. Diamond cutters cut the diamond to specific dimensions in order to maximize brilliance. 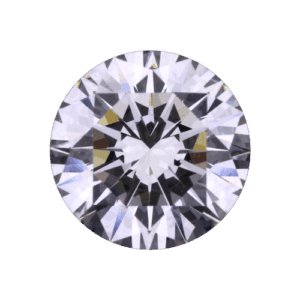 Those same characteristics also cause the aforementioned hearts & arrows in the classical round cut diamond. Unfortunately, many companies develop gimmick modified cuts (rounds, or other shapes) where they manipulate the faceting of the diamond in order to have the same hearts & arrows effect. But, as I explained, the actual hearts and arrows are not what makes the diamond brilliant, its the perfectly brilliant cut that makes the hearts and arrows. For these branded cuts, hearts and arrows give you no indication whether the diamond is brilliant or not. The main goal for most of these companies is not to provide a better cut, more brilliant diamond for the consumer. Their main priorities are to develop a gimmick (that gives them a unique marketing tool) and the ability to patent the cut (so you can’t go elsewhere, which lets them keep the price high). There are notable exceptions. I happen to love Brian Gavin’s Hearts and Arrows Cushion. But for the most part we recommend avoiding these products.